The teaspoon is currently being used to give me my many doses of liquid percocet a day. 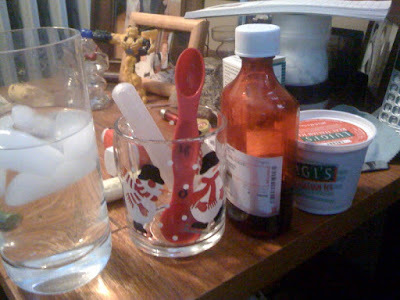 Instead of a hot cocoa with some godiva liqueur, my cute little snowman mug is a place to keep my medicine spoons. My breakfast is cherry italian ice this morning, and oh yes, that's a plastic transformer figure in the background, he's my mascot. I was silly enough to think going into having my tonsils out as an adult that I'd be laid up, in pain, but could still get some writing done this week. I was definitely mistaken. Having a tonsillectomy as an adult is nothing like having it done as a child, so for those out there who are saying, "what a wuss", go ahead and try it, have fun with that. They removed my tonsils on Monday, it's Friday, and there's not a whole lot of effort I can offer. The pain is more manageable today, but doctors say it'll get bad again as I move into the next phase of healing. I've cut back on the pain meds now, knowing I'll need a heftier dose for next week. Oh and that whole, "you can eat all the milkshakes and ice cream you want" line, it's a lie. Dairy makes your mouth feel gross, so it's pretty much a no-no unless it does something magical for you. This is a food blog though right? My menu for pretty much the last few days has been ice cold water alone, or mixed with some Gatorade. Breakfast has pretty much been jello Italian ice. The only food of substance I've had in the past week is cream of wheat. I found the cinnamon swirl to be quite thrilling. I might try soup today, see if I can manage that or not. Another fun side effect if you find yourself having one of these? Your voice. I sound like a Muppet. Specifically, one of those baby Muppet varieties. It still hurts to talk, but I need to keep talking to help strengthen my muscles up there. Sometimes I fall into full-on Muppet talk, it's rather funny. I still can't stick my tongue out too far, I'm sure that has something to do with it. Well, folks, I hope next weeks offers me up a bit more healing, and maybe a shot do some smoothie work or something for you all. My uncle just dropped off a huge box of berries, so I may go attempt to see what my awesome Ninja blender can whip up with it all. I'll be back, meanwhile, if you have any questions about this awesome process, feel free to let me know and I'll try to answer any questions you might have. Kimmie I am SO sorry to hear this! Maybe you could find someone with chicken pox and get that out of the way while you're knocked out anyway. Just kidding. You probably already had that vaccine.Speedy recovery kid! Go Elmo! I've been there! I had my tonsils out summer before senior year of college and the doctor had warned me it feels like pieces of glass in your throat. Turns out, he was right! To this day, I still don't drink milk and mostly avoid ice cream, the dairy still irritates my throat! I switched to soy milk. Other food ideas: scrambled eggs and mashed potatoes! Just let it cool off for an hour to room temperature! Vitamin Water would be good too. Hope you feel better soon! Well, I wish you were telling us you felt better, but at least you still have your sense of humor! Here's a fun fact to get you through the night, my cousin is the nutritionist is the Ninja commercial. Fun, right?